Clinch Gear has teamed up with “The Last Emperor” Fedor Emelianenko to come up with some exlcusive Clinch Gear clothing and equipment. 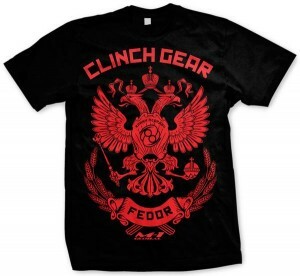 My oh my, it does resemble the RVCA Fedor Emelianenko T-Shirt! The Clinch Gear Fedor Strikeforce Walkout T-Shirt will be worn by Fedor himself as he faces off with fellow heavyweight Fabricio Werdum on the 26th of June 2010. This shirt is an athletic fit, made out of 100% cotton. Comes in black, red and white.